setting audit fees for financial audits. an assessment of Agency audit committees. 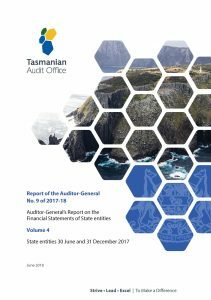 This Report contains a Chapter for the University of Tasmania (University) and its controlled entities; University of Tasmania Foundation Inc (University Foundation), AMC Search Limited (AMC Search) and the Tasmanian University Union Inc (TUU). It also includes a summary Chapter for other 31 December 2017 State entities; ANZAC Day Trust, the Solicitors’ Trust and the Theatre Royal Management Board. The University and the other 31 December 2017 entities included in this Report submitted their financial reports within the statutory deadline apart from the Solicitors’ Trust. The audits were completed satisfactorily and unqualified opinions issued in all instances. The Report also covers the 30 June 2017 audit of River Clyde Trust. River Clyde Trust failed to meet the statutory deadline for the submission of its 30 June 2017 financial statements. This was the third consecutive year it failed to meet this deadline.